An individual’s capacity to self-regulate their cognitions, emotions and actions is an important life skill and emergent developmental competency for both children and parents. Individuals with better self-regulation achieve more positive life course outcomes and are less likely to develop significant mental health, social, and relationship problems. Parenting support programs that promote positive, nurturing parent–child relationships provide a unique multigenerational context to promote the self-regulatory capacity of both parents and children. Such programs provide a meaningful context and many opportunities for parents to enhance their self-regulation capacities, including skills such as goal setting, self-monitoring, self-evaluation, self-efficacy, personal agency, and thought and emotion regulation that, in turn, enable independent problem solving and responsive parenting. Parenting programs based on social learning theory, cognitive behavioral principles, and developmental theory typically include structured session activities and homework tasks that can be optimized to promote parental self-regulation. These include enhancing executive functions such as anticipating, planning ahead, following a plan, and problem solving, so that parents acquire greater cognitive flexibility, better impulse control, and are better able to generalize and apply learned parenting principles and skills beyond their immediate concerns to a broader range of child problems and challenging parenting and family situations. We illustrate how positive parenting principles and strategies can promote enhanced self-regulation, and discuss implications for research and practice. Raising children requires parents to self-regulate their own attention, cognitions, emotions, and actions, so that they can be nurturing and responsive with children and successfully undertake the diverse range of tasks and responsibilities that being a parent requires (Crandall et al. 2015; Sanders and Turner 2018). Parents infer children’s needs and the appropriate response in particular situations from a range of contextual cues and information about the child’s emotional state and behavior (verbal responses, expressed emotions, gestures, movements, actions). A parent must be observant and attend to these cues to generate hypotheses or ideas about the child’s current needs. Being observant helps parents modulate or adjust their own behavior and thereby ensure that their responses are developmentally appropriate and contextually relevant and contingent (Sanders and Mazzucchelli 2013). In modulating their own behavior, parents must be attuned to their child and also their own cognitions, emotions, and behavioral responses. This includes figuring out how to respond to their child’s prosocial and problem behaviors. It involves deciding what to say and do (words and actions), how to convey their message (tone of voice, facial expression, body language), and how to time (e.g., immediate, delayed), organize, and sequence their actions (e.g., check for safety then respond to a challenging behavior). Self-regulation has an important role in moral development, empathy, emotional expression, adjustment, social competence, delay of gratification, goal setting, and acting in accordance with one’s goals (Eisenberg and Spinrad 2004). We make the case for viewing self-regulation in two ways: as an important mechanism of change that helps explain change (or lack of it) in parents’ behavior and interaction with children; and as a potential intervention target in a parenting program to enhance parental autonomy, flexibility, confidence, and effectiveness in resolving parenting challenges and maintain positive changes over time. This paper discusses the definition, determinants, and impacts of parental self-regulation; how the tasks and responsibilities of parenting require self-regulation capacities, and how parenting programs can be used to enhance these capacities; and implications for research and practice. What is Parental Self-Regulation and Why is it Important? The capacity for parents to control their thoughts, emotions, and behavior in response to cues and information about the current context, state and needs of children, and sometimes the behavior of others (e.g., partners, grandparents, child carers, teachers, coaches), is fundamental to successful adaptation to the role of being a parent. In daily moment-to-moment interactions, effective parents continuously maintain awareness of their own behavior, the needs and behaviors of their child, and the exigencies of the immediate social context, and respond appropriately according to their values and goals for their child and family. Although parents’ approach to raising their children is strongly rooted in their social, economic and cultural context, and their family of origin experiences, ultimately, parents have to determine how they wish to raise their children and to take responsibility for their decisions and actions (Fung et al. 2018). Parents must decide what behaviors, skills, and values they wish to encourage in their children, and the methods of parenting they will adopt to achieve their parenting aspirations (e.g., how they will encourage desirable behaviors, teach new skills, set limits, discourage problem behaviors), and their self-regulatory capacity influences how they will respond to the in-the-moment challenges of parenting. Self-regulation was usefully defined by Karoly (1993) as: “…those processes, internal and/or transactional, that enable an individual to guide his/her goal-directed activities over time and across changing circumstances (contexts). Regulation implies modulation of thought, affect, behavior, or attention via deliberate or automated use of specific mechanisms and supportive meta-skills.” (p. 5). Self-regulatory processes can be intentional (top-down) or automatic (bottom-up), involving both reflexive and learned responses (Strauman 2017). Top-down self-regulation is defined as effortful control, a temperament or dispositional trait emerging from executive function relating to self-regulation (e.g., executive attention, cognitive control, response inhibition; Nigg 2017). Diamond (2013) described lower-level executive functions (e.g., working memory, cognitive flexibility) as the building blocks of higher-level executive functions (i.e. reasoning, problem solving, planning). These executive functions serve to shift the control of behavior from the immediate social and temporal context to self-regulation by internal representations regarding the hypothetical social future (Barkley 2001). In the case of parents learning to become a parent or to strengthen their parenting practices, self-regulation refers to parents having the skills they need to self-monitor and adapt their own attributions and behavior, and to be independent problem-solvers. This has been operationalized as a multi-component process (both reflexive and learned) involving many complex skills and executive functions that fall under five key elements (Sanders and Turner 2018): (1) Self-sufficiency. Parents develop the resilience, personal resources, knowledge, and skills to parent confidently and effectively with minimal support. (2) Self-efficacy. Parents believe that change in their child’s and their own behavior is possible, and they can manage parenting challenges. (3) Self-management. Parents have the skills to improve their parenting practices (e.g., set goals, choose parenting strategies, self-monitor, self-evaluate, and set further goals). (4) Personal agency. Parents attribute positive change to their own or their child’s efforts rather than to chance, maturation, or other uncontrollable events (e.g., genetic makeup). (5) Problem-solving. Parents can define a problem, identify potential solutions, develop a plan, execute it and track its success, and revise the plan as required. These elements are discussed in detail later. Self-regulation involves a range of factors including “genetic/genomic processes; neurophysiology (particular executive processes and emotional/motivational processes); psychological processes (cognitive, motivational, and emotional); and interpersonal, social, and cultural factors that elicit, facilitate, or impede people’s efforts to self-regulate” (Strauman 2017, p. 502). Put simply, the development of self-regulation is related to personal, behavioral and environmental factors, which operate separately but are interdependent (Bandura 1986), and evolve in a broad social context that can support or hinder its development (Karoly 1993). Thus, there are both intrinsic and extrinsic processes involved in self-regulation development (Eisenberg 2017). Some of the key influences on parents’ self-regulatory capacity are expanded upon here, from basic biological processes and temperament, to experiential factors, and social and macro-social factors. These factors all interact to determine an individual’s self-regulatory capacity. In addition to environmental influences such as parenting, environment, and experience (discussed further below), Bell and Deater-Deckard (2007) proposed a dynamic interplay between psychophysiology, genetics, and behavior. The psychophysiological processes of attention, cognition, and emotion act as intermediaries between gene expression and complex psychological and behavioral outcomes, and can account for individual differences in top-down and bottom-up self-regulatory processes. Their 2007 review synthesized twin studies (e.g., heritability of attention, working memory, and effortful control), behavioral genetics (e.g., genes involved in the production and utilization of neurotransmitters such as serotonin and dopamine), and neuropsychological studies of brain architecture and function (e.g., central and peripheral nervous system connectivity and activation in the prefrontal cortical and limbic regions of the brain); all implicated in the development of cognitive and emotional processing, decision-making, and autonomic nervous system modulation. Biologically based individual differences in emotional reactivity are referred to as temperament. Two inhibitory systems of temperament (fearfulness and effortful control) have been identified as critical to the regulation of that reactivity (Caspi et al. 1995). According to Kochanska and Aksan (2006), fearfulness or anxious arousal after transgressions serves to shape future behavior and internalized standards, building one of the bases for regulation of emotional reactivity. Effortful control, which begins to emerge in toddlerhood, develops into attentional, behavioral, and impulse control. Variations in autonomous self-regulation may be linked to variability in these temperament characteristics, but are also affected by socialization experiences. Both are promoted by warm, positive, mutually trusting parent–child relationships, and are undermined by parental power assertive discipline practices. As noted above, parents’ own family of origin experiences can affect the development of their self-regulatory capacity. Socialization begins within the family. Parental discipline style and the quality of the parent–child relationship influence brain development and function, which is implicated in emotion processing and executive function (Whittle et al. 2017). This socialization involves learning through observing and experiencing patterns of reinforcement. Adverse childhood experiences (ACEs), such as exposure to child abuse, parental divorce, living with a parent with substance abuse or mental health problems, an incarcerated parent, or witnessing violence towards their mother (Felitti et al. 1998), have significant social and health impacts, and can impact brain development, structure, and function in predictable ways (Anda et al. 2006). These impacts include decreased executive function (e.g., concentration, memory, planning, problem solving), empathy (e.g., theory of mind, compassion), and emotion regulation (e.g., heightened vigilance, anxiety, irritability, aggression). Planful parenting can be particularly challenging when a parent’s self-regulation capacity is adversely affected by factors such as mental health (e.g., depression, psychosis) or substance abuse problems, or a parent is overwhelmed or exhausted (e.g., with a child who has a significant mental health or developmental problem, chronic or life threatening health condition). Parents with serious untreated mental health or substance abuse problems are more likely to have impaired capacity to regulate their cognitions, emotions, and behavior (Calam and Wittkowski 2018). Nigg (2017) encapsulated the literature linking poor self-regulation and mental health issues such as ADHD, internalizing and externalizing psychopathology, addiction, mood disorders, eating disorders, personality disorders, schizophrenia, and autism spectrum disorder. Self-regulatory dysfunction can create and maintain dysfunction within other regulatory mechanisms, and vice versa (Barkley 2001; Stith et al. 2009). Parenting occurs within a broader ecological context of family, community, and socio-political factors that can either support or restrict a parent’s self-regulatory capability. Bronfenbrenner’s model of human development (Bronfenbrenner 1986; Bronfenbrenner and Morris 2006) provides a useful conceptual framework for understanding the multiple interacting social determinants of parental self-regulation. The family is considered a microsystem nested within a range of other systems that affect parenting directly and indirectly. Within-family proximal influences include a parent’s mental health and the quality of family relationships. For example, when a parent lives in a highly conflictual or violent intimate partner relationship, or has critical parents or parents-in-law, the parent’s efforts to exercise greater personal control may be undermined or actively discouraged. More distal influences include friends, child care and education settings, workplaces, community and health care systems (mesosystemic influences), and larger exosystems such as economic conditions, social policies, and mass media. These influences are all embedded within a context of cultural ideologies and values (macro system) and may influence parents’ parenting confidence, skills, and self-regulation. Parental self-regulation is fundamental to the maintenance of positive, nurturing, non-abusive parenting practices that promote good developmental and health outcomes in children (Clark and Frick 2016; Sanders and Mazzucchelli 2013). Effective, positive parenting can influence children’s own capacity for self-regulation (Kochanska and Aksan 2006; Neville et al. 2013). Conversely, harsh parenting is linked to poor inhibitory control, internalizing and externalizing problems, and other detrimental outcomes in children (Gershoff and Grogan-Kaylor 2016; Olson et al. 2011). Three key mechanisms through which this occurs are parental modeling of regulatory approaches, emotional climate (involving both secure parent–child attachment and positive couple relationships), and contingent positive responding (Rutherford et al. 2015). The latter includes helping children learn language, social, emotional, and problem solving skills through attending, prompting and reinforcement, as well as contingency management strategies to help children deal with dysregulated emotions such as disappointment, frustration, and anger (Sanders and Mazzucchelli 2018). For example, experiencing positive parenting promotes children’s development of effortful control, and the relationship is bidirectional (i.e. younger children’s effortful control influences parenting, and at older child ages, parenting influences children’s effortful control), and stable (i.e. the influence of parenting behaviors in childhood continues through to adolescence; Tiberio et al. 2016). Conversely, parental impulsivity, risk-taking, and breakdowns in response inhibition have obvious implications for stable, predictable, responsive parenting. For example, impulsivity can impair a parent’s decision-making about whether and how to react to child behavior, and to potentially opt for short-term gain, such as capitulating to demanding behavior to end a tantrum (and therefore reinforcing the child’s emotional escalation), over long-term goals such as teaching the child skills like asking nicely and waiting (Harrison 2017). Parents’ inability to regulate their own cognitions, emotions, and behavior has been linked to family issues such as domestic violence, child maltreatment, and neglect (Stith et al. 2009). Specific concerns include: poor supervision (e.g., monitoring children’s whereabouts and safety); disorganization and poor time management (e.g., chaos or lack of predictable routines); poor planning (e.g., having no engaging activities available for children); inability to focus (e.g., prioritize and problem solve); and attributional bias (e.g., attributing child behavior to some internal, stable, and negative characteristic of the child). Children of parents with significant emotion dysregulation, such as explosive anger or social and emotional withdrawal, are at increased risk of a range of adverse outcomes, including behavioral, social, and educational difficulties, and poorer physical and mental health (e.g., Goodman et al. 2011; Oyserman et al. 2005). One of the key mediators identified is a lack of parenting confidence (Oyserman et al. 2005). These issues highlight the risk of intergenerational transmission of self-regulation difficulties and provide a strong rationale for effective parenting interventions addressing self-regulatory deficits (Calam and Bee 2018). Normative neurobiological, hormonal, and behavioral shifts come with the transition to parenthood, which brings challenges such as managing one’s own emotions while responding sensitively to a child, particularly when the child is upset or distressed. Variability in these shifts may contribute to difficulties in parents’ self-regulation, which in turn influences their children’s developing self-regulatory functioning (Rutherford et al. 2015). Many parenting skills that promote healthy development and learning in children are more complex than they first appear. 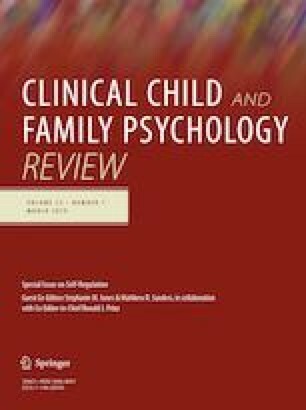 Evidence-based parenting programs for parents of oppositional children typically equip parents to teach children to follow age-appropriate instructions and limits (e.g., Incredible Years: Webster-Stratton and Reid 2017; Triple P-Positive Parenting Program: Sanders and Turner 2017; Parent–Child Interaction Therapy: Zisser-Nathenson et al. 2017; Parent Management Training: Kazdin 2017; Helping the Non-Compliant Child: McMahon et al. 2011; Strengthening Families Program: Kumpfer et al. 2016). As an example, in Triple P (Turner et al. 2015), parents are taught a ‘start routine’ to encourage a child to follow an instruction to initiate an action (e.g., put toys away). The routine involves a sequence of simple steps the parent must remember and carry out in sequence: getting physically close to the child (within an arm’s length so the child can hear), using the child’s name (to gain their attention), giving a calm, specific instruction or direction (so they know what to do), and pausing for a few seconds (so they have time to finish what they are doing). If the child follows the instruction, the parent uses descriptive praise to encourage instruction following. If the child does not follow the instruction, the parent calmly repeats the same instruction and pause, then backs up immediately with a brief consequence (1–5 min) if the child escalates, refuses to comply, or tantrums. Examples of consequences include removing the toy or activity at the center of the problem (without threats or warnings), quiet time (in the same space, to break the escalation trap), or time-out (in another area, to calm themselves down). After the consequence, the parent gives the instruction again and descriptively praises the child’s instruction following (“Thank you for putting away your toys. Well done”). Learning this cooperation, or ‘start’, routine and many other parenting practices such incidental teaching (e.g., to encourage use of language), ask-say-do (to encourage independence), and developing daily routines (e.g., mealtime and bedtime routines), requires parents to be aware of cues and opportunities, and follow a planned sequence of actions. The required actions vary depending on the child’s response (cooperation or refusal). To learn such routines, parents need to remember the correct sequence of steps, what to say and how to say it, and what not to do (e.g., threats or raising voice) at each step. For the procedure to be effective, the parent must regulate their own emotions (e.g., remain calm, avoid getting impatient or angry), and refrain from coercive escalation or impulsive behavior (e.g., threatening, shouting, hitting) or otherwise being dysregulated or overreacting (e.g., shaming, verbally abusing, hurting the child). Parents must also view the parenting challenge as enough of a concern to be motivated to change their current pattern of behavior, which may be inadvertently contributing to the problem, and to keep track over time to ensure their actions are appropriately contingent. They may also need to recognize when exceptions are appropriate and a different response is needed (e.g., when a child is unwell). Parents also need knowledge about normal child development to enable them to be sensitively attuned to the capabilities of their children and the parenting practices most suited to their children’s stage of development. Some parenting skills and strategies are appropriate and effective for children at all stages of development (e.g., descriptive praise, affection, interesting activities), whereas others (e.g., time-out) work well at certain developmental stages (e.g., older toddlers and preschool-aged children) but not so well at later stages of development. Others work better when children have developed greater cognitive capabilities (e.g., conflict management, negotiation, and behavioral contracts). However, while parenting knowledge may predict parents’ disciplinary choices, parental self-regulation and impulsivity are also significant predictors of parenting style (e.g., self-reported impulsivity predicts laxness and over-reactivity; Harrison 2017). Thus, increasing knowledge alone may be insufficient to elicit desired changes in parenting (Winter et al. 2012). Parenting involves not only using self-regulatory skills in relation to the self, it also involves simultaneously promoting the development of self-regulatory capacities in a child by creating an environment conducive to the child’s socialization and development (Calam and Bee 2018). The development of an individual’s capacity for self-regulation should be a central goal of parenting interventions (Sanders and Mazzucchelli 2013). In this context, developing a parent’s capacity for self-regulation means assisting them in acquiring the skills they need to monitor and change their own behavior and become independent problem-solvers and controllers of their own destiny as a parent. Most parenting programs provide temporary and transitional support for parents (over a period of a few weeks or months). To maintain any gains, parents must take personal responsibility for future parenting decisions and learn to parent independently of long-term professional support. Parenting interventions that emphasize self-regulation seek to promote parents’ independence and autonomy in resolving their children’s developmental, emotional, and behavioral issues. The approach specifically uses program activities that activate self-regulation skills (e.g., self-sufficiency, self-efficacy, self-management, personal agency, and problem-solving) so that parents can flexibly apply what they learn to different child behaviors, the changing capabilities of children, and different child-rearing contexts (Sanders and Mazzucchelli 2013). This approach contrasts with more directive approaches that provide specific advice, modeling, and practice for parents in managing particular problems (e.g., disobedience, aggression, tantrums, sibling conflict) but have less emphasis on teaching parents the tools of personal change, independent problem solving, and generalizing learnings from exemplars discussed in programs to different siblings, settings, tasks, and over time (Palmer et al. 2018; Sanders and James 1983). Effective parenting support programs provide a structured, time-limited, and supportive interpersonal context that can motivate, encourage, and activate self-regulatory processes in parents. Regular individual contact with a well-trained, skilled, and supportive parenting practitioner, or with a skilled group facilitator and other parents, provides a structured opportunity for learning self-regulation skills. These skills can be modeled, prompted and reinforced by practitioners in an emotionally supportive context through session activities and between-session homework tasks and challenges. Most manualized parenting programs use a set curriculum (e.g., practitioner manuals, session protocols, parent workbooks, video resources) based on a well-defined theory (e.g., social learning theory). These programs typically pre-specify program goals and activities designed to teach parents the skills to promote child development and prosocial behavior, and to prevent or manage problem child behaviors. In practice, the most effective programs adopt a therapeutic alliance and collaborative approach in working with parents (Sanders and Burke 2014). Parenting programs have the potential to empower parents by providing greater emphasis on building self-regulatory capacity. This is achieved by involving them in key decisions, identifying the methods of parenting they would like to use to achieve desired changes in their own and their child’s behavior. When parents have an opportunity to self-determine parenting goals (e.g., reducing shouting at children, reading daily with children) instead of simply adopting goals as prescribed by a practitioner or parent workbook, there is a greater capacity for programs to be individually tailored to parents’ aspirations, priorities, and preferences. Parents who have children of the same age have both common and disparate needs. Some parents want to focus on addressing problem behaviors (e.g., disobedience, tantrums, aggression, bullying). Others focus on teaching new skills (e.g., independent toileting, bedtime routines, getting ready for school) or to increase desirable or prosocial behavior (e.g., being respectful and speaking politely, making friends, caring for and helping others). Others focus on all areas. When parents struggle to identify the specific changes they would like to make, practitioners attuned to promoting self-regulation will provide prompts but avoid stepping in and taking over responsibility for making decisions, which can inadvertently foster parents’ dependence on professionals to make crucial parenting decisions for them. This approach promotes parents’ self-sufficiency and personal agency. Parents should reflect on whether the parenting techniques they intend to use in a parenting plan are consistent with their cultural values, personal priorities, and life circumstances (El-Khani and Calam 2018; Fung et al. 2018). For example, the Te Whānau Pou Toru project in New Zealand used a cultural adaptation of brief low intensity Triple P discussion groups (Level 3) with indigenous Maori parents (Keown et al. 2018). Parents were asked to reflect on whether their parenting plan was culturally consistent with principles of Tikanga (the Maori way of doing things) before implementing a program with their children. This helped to ensure that parenting plans and cultural values were harmonized. It is tempting to assume that professionals are in the best position (due to their training and knowledge of available programs and supports) to decide what level of parenting support a parent might require. Indeed, evidence-based lists (e.g., Blueprints for Healthy Development, Early Intervention Foundation, California Evidence-Based Clearinghouse for Child Welfare) require program developers to be quite explicit about the target population and the type of children that will benefit from an intervention. This encourages an approach in which the decision about type and level of intervention is largely left in the hands of the professional. However, parents have clearly different preferences for the way they access parenting support (Metzler et al. 2012), often favoring self-administered or technology-based approaches over more intensive in-person approaches. One important advance in parenting research has been the development of flexible delivery options so that program offerings are not a “one size fits all” proposition. This enhanced capacity for choice ensures that parents can participate in programs directly relevant to their own needs, interests and capacity. For example, a population-based multilevel intervention such as the Triple P system (Sanders 2012) has developed evidence-based program options to increase program reach (group, individual, online, over the phone). These program options involve different levels of intensity and parental commitment (from 90-min “light touch” seminars and 2-h topic-specific discussion groups, to 10–12 h intensive programs with additional modules for specific personal and family issues). Program variants are available for different age groups (infants, children, adolescents), populations (e.g., parents of children with disabilities), and modes of delivery (e.g., individual 1:1, large or small group, self-directed online). When different options are available, parents can decide which program variant and mode of delivery best suits their personal circumstances (according to preferences, needs, cost, time). This approach was used in a large-scale population rollout of the Triple P system in Ireland (Doyle et al. 2018), where parents were able to choose how they wished to participate (either in seminars, workshops, or more intensive group programs). Parents tended to select programs that were most appropriate to their needs, such that parents with more severe problems were more likely to select the intensive eight-session program than parents with milder problems, who tended to select the low-intensity seminar program. Many practitioners are reluctant to give full responsibility to parents to decide on the level of support they receive, partly because practitioners may be funded to deliver certain types of support and not others. However, allowing parents to make choices about format and dosage builds self-sufficiency and self-efficacy, and can avoid inappropriate- or over-servicing. The principle of minimal sufficiency in service delivery is useful to keep in mind when fostering self-regulation in parents. Minimal sufficiency refers to the least amount of practitioner support, guidance, and feedback a parent needs to learn a new skill or behavior. For example, a practitioner may provide a rationale and specific examples of a strategy like setting clear, specific, and measurable goals, then prompt a parent to set their own goals. Practice, combined with constructive feedback and prompts, can be used to help shape a parent’s capacity to set realistic attainable goals as required. The level of scaffolding support or guidance can be varied according to the parent’s capacity to undertake a task with minimal assistance. In this approach, each parent has primary responsibility for choosing which aspects of their own and their child’s behavior they wish to change, and which parenting strategies (from a range of presented options) they choose to try out. The practitioner’s role is to be an enabler, providing the minimally sufficient level of support a parent requires to acquire or maintain a skill or new behavior. This scaffolding approach to supporting skill development has the advantage of enabling movement between therapist-directed activity (e.g., showing video or live demonstration, conducting a structured role play) and parent-led activity (e.g., reviewing their homework, sharing their observations following a group activity). Over the course of a program, practitioners should gradually reduce (fade) the amount of direct input they provide, and prompt parents to drive the process. As parents become more proficient with self-directed learning, practitioners can become less directive, which fosters parents’ self-sufficiency, self-management, and personal agency. Participation in evidence-based parenting programs can offer a valuable context for parents to learn self-regulation skills. Changes in self-regulatory capacity over time are an important potential mediator of change in parenting practices and ultimately child behavior change (Barros et al. 2015). The process of learning to improve one’s own parenting practices involves using higher-order executive functions to control and regulate attention, thoughts, emotions, decisions, and goal-directed behaviors. This includes the ability to initiate and stop actions, to monitor and change behavior as needed (adapt to changing situations), and to anticipate and plan future behavior when faced with novel challenges and situations. These processes are embedded in a self-regulatory approach to parenting intervention addressing the key capacities discussed below. The ultimate goal of a parenting intervention is for a parent to leave with the necessary personal resources (knowledge, skills, and experience) to maintain and further extend any gains achieved, and be able to independently address future issues with the same child or other children in the family. Self-sufficient parents have the necessary resilience and resources to parent effectively with minimal or no additional support from services or social networks. This pursuit of self-sufficiency should not mean that parenting becomes socially disconnected from essential social support networks (e.g., friends, relatives, childcare, healthcare) or viewed as an insular, individual activity, even though most parenting is undertaken privately in the home, particularly in families with little or no extended family support. On the contrary, parents can be encouraged to build healthy support networks and access support from extended family, friends, and others such as childcare and community services, and online parent support networks (Love et al. 2016). Parents are encouraged to view parenting decisions as their own personal responsibility, and as an exercise of their own judgment and choice. However, canvassing the views of others is part of having the knowledge or information required to make an informed choice (e.g., at what developmental stage to introduce certain expectations). Programs can also advocate for the importance of getting support when needed to allow parents to have time to themselves. Many parenting interventions seek to increase parents’ confidence in resolving personally relevant problems. Parents of children with significant behavioral and emotional problems often enter parenting programs with low self-efficacy in their capacity to handle specific behaviors (e.g., aggression, tantrums, fearfulness). They also tend to have lower task-specific self-efficacy (e.g., getting their child to bed, taking their child shopping) in managing their daily parenting responsibilities (Sanders and Woolley 2005). Over the course of a parenting program, parents’ self-efficacy typically improves as they master and apply new skills, and start to accomplish their goals. Parents develop both global and task-specific expectations that are associated with future attempts to change behavior, persistence, and recovery from setbacks and disappointments (Bandura 1977, 1994). As parents learn to apply positive parenting skills (such as descriptive praise, incidental teaching, clear instructions, back-up consequences), they become more observant of their child’s behavior and their own responses to it. This increased observational skill involves tuning in to and responding positively to specific occurrences of their child’s prosocial behavior that they wish to encourage, and responding without delay to problematic behaviors (e.g., verbal or physical aggression) with clear, calm instructions and appropriate follow through (e.g., logical consequence, quiet time). It also involves refraining from acting in ways that might worsen problem behavior (e.g., shouting, threatening, providing attention to inappropriate behaviors such as demanding or whining). These types of actions require parents to tune in to the initiation and termination of child behaviors, and to modulate their own behavior and employ essential executive functions (memory, anticipation, planning ahead, organization, goal determination, behaving in accordance with goals, emotion regulation, adjusting behavior in light of ongoing circumstances, and problem solving). They may need to modulate and control the outward expression of their own anger or frustration, or manage their “reflexive” negative response in favor of a more positive, calm response in keeping with their positive parenting goals. As part of this self-management, parents can be encouraged to self-evaluate whether they achieved a performance standard or goal they set out to achieve over a defined time period, and self-reward (e.g., positive self-feedback, rewarding activity) when they achieve a goal. Parents’ personal agency can be promoted by ensuring that parents experience success in achieving desired changes. Success is more likely when parents set realistic achievable goals for themselves and their child, parents’ efforts at changing their own behavior is reinforced by corresponding changes in the child’s behavior, and parents attribute positive family change to their own and their child’s efforts. Parents develop explanations (attributions) as to why their child behaves as they do, and why their child’s or their own behavior changed or failed to change during a parenting program. A self-regulation approach encourages parents to ‘own’ change and attribute change in their situation to efforts they have made to produce that change. This involves encouraging parents to search for and attribute improvements in their child’s behavior or family situation to their own efforts rather than to chance, maturational factors alone, the practitioner’s skills or empathy, or other uncontrollable events (e.g., a partner’s poor or good parenting or genes). Parents may be reluctant to take responsibility for setbacks or credit for improvements. It is tempting for practitioners to feel reassured when a parent reports that their child’s improvement is a direct result of the practitioners’ efforts. However, the practitioner should be careful not to inadvertently reinforce explaining change in ways that discount or minimize parents’ own efforts. In such circumstances, the practitioner can prompt the parent to identify what they are doing differently that has enabled their child to change or learn a new behavior. In some cases, change in child behavior may be the result of multiple concurrent factors (including efforts of teachers). However, if parents do not see any relationship between their own efforts and observed improvements, they are less likely to see parenting as a key influence on their child’s wellbeing in the future. Successful parenting requires parents to be active problem-solvers. Parenting interventions can help parents learn to define problems clearly (i.e. what specifically does a child do that is a problem), formulate and weigh up options for solving a problem, develop a practical parenting plan to prevent or manage a problem (e.g., new after school routine), implement a plan, evaluate the outcomes achieved, and revise their parenting plan as required. A successful intervention process needs to assist parents to generalize the knowledge, principles, and skills they have learned so they can apply them to similar or new future problems, at different points in a child’s later development, and to other children and contexts as appropriate. There is growing support for the integration of specific self-regulation (particularly emotion regulation) strategies into family interventions for parents of children with difficulties such as conduct problems (Barros et al. 2015; Kohlhoff et al. 2016). Table 1 provides detail on a variety of self-regulation skills that can be promoted through positive parenting programs, the program activities and practitioner behaviors that promote those skills, and the outcomes that might be expected. Unfortunately, participation in parenting programs can be difficult for many families for a variety of reasons, such as inconvenience of location or time, lack of means to attend (e.g., transportation), interference of life demands (e.g., child care, work schedule), concerns about stigma, and limited access to practitioners or programs in communities, particularly in rural areas (Correlejo and Domenech Rodriguez 2018; Spoth and Redmond 2000). Technology-based self-administered programs have become increasingly popular with parents, and are often a preferred delivery modality for parents to receive advice and information about parenting (Metzler et al. 2012). Delivering parenting programs through self-administered approaches (e.g., interactive online programs, mobile phone- or tablet-based apps, DVD or streamed videos, podcasts) allow parents more control and flexibility, greatly increase the potential reach of parenting interventions, and reduce delivery costs, logistical barriers to program access, and potential stigma associated with in-person delivery. Parents can tailor program intensity to match their needs, concentrate on areas of interest, work through the materials in private, and control the time, place, and pace of learning (Bennett and Glasgow 2009; Metzler and Rusby 2017; Ritterband et al. 2009). Although some families need the more intensive supports of a face-to-face intervention, self-directed and technology-based interventions can be a valuable option as part of a larger system of supports, provide a supplement to intensive programs, reach those who might not otherwise be reached, and provide sufficient dosage for many (Metzler and Rusby 2017). There are a number of features of online and mobile app-based parenting programs that can facilitate the development of self-regulation skills. These programs often structure and sequence the introduction of concepts and strategies, provide step-by-step training of skills, and harness video modelling and other modes of presentation to engage the user and present content in a way that promotes self-efficacy and personal agency. Interactivity features can be used to prompt parents to self-determine their own goals and choose targeted strategies, self-monitor and self-evaluate their behavior, practice skills, set goals for home practice, track progress toward goals they have made, assess knowledge acquisition, and promote problem solving, decision making, and behavior activation. These techniques for promoting self-regulation are all well-suited to technology applications, which can guide the user through the process with audio or visual prompts and intuitive and engaging interfaces (Bennett and Glasgow 2009; Nieuwboer et al. 2013a; Turner et al. 2018). In the Triple P Online program (Turner and Sanders 2011), for example, interactivity is explicitly used to activate parents’ self-regulatory processes; in addition, parents can set prompts and reminders to encourage their own completion of the program, and downloadable worksheets can be used to track personal progress. It should be noted that working through an online or other self-administered parenting program requires a significant level of motivation and commitment. Although some online parenting programs are accompanied by a practitioner coach who guides parents through the materials and prompts completion of the activities, many programs are fully self-guided, relying on parents to self-organize and self-motivate to complete the program. Organizing oneself to complete a self-directed program can be particularly difficult for some parents, especially those in stressful or chaotic environments, or those who struggle with mental health difficulties, substance use, economic hardship, or just the distractions of a busy life with young children. It should be noted, however, that self-directed parenting interventions are consistent with the principle of minimal sufficiency as it relates to self-regulation, in that parents determine their own dosage. They can choose to discontinue a program when they have met their needs and achieved their own goals. A number of online and other technology-based parenting interventions have achieved positive impacts on family outcomes (e.g., Baggett et al. 2010; Baker et al. 2017; Irvine et al. 2015; Sanders et al. 2012). In fact, several recent meta-analyses and systematic reviews indicate accumulating evidence that online parenting programs can be effective with parents of children with conduct problems (Baumel et al. 2016; Breitenstein et al. 2014; Correlejo and Domenech Rodriguez 2018; Nieuwboer et al. 2013a; Tarver et al. 2014). In general, these meta-analyses and systematic reviews show that online and other technology-based self-directed parenting interventions can have medium-to-large effect sizes on reducing disruptive child behaviors and on improving parenting behaviors (such as harsh and inconsistent discipline), with smaller effects on parenting confidence, stress, and mood. This evidence underscores that in-person intervention is not always required to achieve change, even with at-risk families, and that a variety of modalities can be useful in promoting improvements in parents’ self-regulation and parenting behaviors. Despite their promise, technology-based parenting programs still carry challenges, especially with regard to keeping participants engaged over time (Day and Sanders 2017; Dittman et al. 2014; Ehrensaft et al. 2016). Competing demands on parents’ time and attention, lack of accountability, and the tendency toward short attention spans in online interactions combine to test a parent’s self-regulatory capacity to sit down and start the program, focus on making progress, and come back repeatedly to finish it. Not surprisingly, greater online program completion is associated with better outcomes on both parenting and child behaviors (Baker et al. 2017; Dittman et al. 2014; Ehrensaft et al. 2016). Because self-directed interventions require self-motivation and self-organization, engagement in technology-based interventions is a challenge across a wide range of health and mental health domains (Christensen et al. 2009; Greenhalgh et al. 2017). Increased attention is now being paid to understanding non-adherence and how to improve engagement in self-directed technology-based interventions (e.g., Greenhalgh et al. 2017; Scholten et al. 2017; Schubart et al. 2011). When parents discontinue a self-directed parenting program, some may have made an active choice that they have received sufficient dosage to meet their needs, and others may need encouragement to continue engaging through core program material. Lower levels of child problem behavior at baseline, more economic security, higher educational levels, and fewer working hours are factors that have been shown to be associated with better program engagement in online parenting interventions (Metzler et al. 2018). Lower levels of child behavior problems at baseline also appear to be associated with better outcomes on child and parenting behavior; however, results are mixed about the extent to which sociodemographic factors are related to child and parent outcomes for online parenting programs (Baumel et al. 2016; Dittman et al. 2014). Recent evidence suggests that technology-based parenting programs that include direct contact with a practitioner “coach” show improved engagement and outcomes on child and parenting behavior over entirely self-directed programs without practitioner contact (Day and Sanders 2018; Nieuwboer et al. 2013a, b; Tarver et al. 2014). This coaching can be provided through email, websites and forums, video conferencing, in-person meetings, or telephone calls (Correlejo and Domenech Rodriguez 2018; Nieuwboer et al. 2013a). Typically, the coaching serves to provide personalized guidance, encouragement and empathy, and “supportive accountability”, in which the social presence and active follow-up of a practitioner increases extrinsic motivation for engaging in the program (Mohr et al. 2011). This increased motivation may be linked to more active use of the program and accordingly better outcomes (Day and Sanders 2017). Love and colleagues (2016) used an online moderator to encourage and reward participation and skills practice, as well as social networking and gamification features (e.g., comments, liking others’ posts, badges for practice of targeted parenting strategies) to successfully engage a population of highly vulnerable, very high-risk families in an adapted version of Triple P Online. Presumably, the combination of supportive accountability from the accredited provider and the incentive value of the social networking and gaming features helped to activate and/or improve these parents’ self-regulatory skills to engage in the program. Day and Sanders (2018) found that adding telephone coaching (average of 2 h over the intervention period) to Triple P Online improved both engagement in the program and subsequent behavioral outcomes, compared to fully self-directed program. Interestingly, mediator analyses (Day and Sanders 2017) showed this effect was particularly strong for parents who reported higher levels of depression at baseline; that is, those with baseline depression benefitted less from the fully self-directed program, but those with baseline depression who received additional telephone support had similar outcomes to those who were not depressed. Telephone support appeared to have an impact on increasing self-efficacy, especially for those who were depressed at baseline, and self-efficacy was an important mediator of treatment efficacy. For parents experiencing significant levels of distress, practitioner support may help to ensure that parents gain the confidence they need to make changes in their parenting practices. Telephone support also improved engagement in the program and had clinical impact over and above its effect on engagement, possibly through its focus on providing tailored feedback, encouragement of active planning and practice of skills, and focus on enhancing self-regulatory skills. A self-regulation approach in parenting interventions works on the assumption that regardless of a parent’s entry-level skills, parents are capable of learning better self-regulation over time. Consider the differences between these two parents experiencing difficulties with tantrums in a 6-year-old child. One parent reports trying an approach recommended in a positive parenting seminar for about 3 weeks (praise for cooperation, 3 min of time-out for tantrums). The approach worked initially but not over the past 10 days; the child was still having tantrums about five times a day. The parent asked directly whether they were doing something wrong with the implementation of the routine and requested specific advice to try to solve the tantrum problems. In contrast, another parent reports having “tried everything” but nothing has worked, and they feel exhausted, overwhelmed and defeated. They report feeling resentful towards the child, and admit they have given up trying to address the problem. These two presentations illustrate differences in self-regulation capacity. The first parent is a problem solver, had already tried a solution, and is now seeking specific additional advice to refine their plan to solve the problem. The second parent feels powerless, is pessimistic about the future, and has desisted from looking for assistance or expecting change. An immediate clinical challenge for a practitioner is to determine where to begin when parents enter from very different starting points with respect to their self-regulatory capacity. Parents differ in their capacity to self-regulate their own behavior and emotions. The initial assessment should seek to clarify the extent of self-regulation difficulties a parent may experience. Routine use of reliable and valid self-report measures can help clarify whether the parent experiences difficulties with mood or emotional dysregulation (anxiety, stress, depression, anger), substance abuse, or has a history of impulsive behavior, ADHD, conduct disorder, abuse, neglect, family violence, or relationship conflict. When parents report difficulties in managing or controlling their own emotions and actions, the practitioner should clarify how these difficulties affect their day-to-day capacity to parent (e.g., becoming impatient, irritable, angry). Further inquiry can determine what, if anything, the parent has tried to address the problem, and whether it worked. It is likely that the greater the parent’s limitations in self-regulation capacity, the more intensive a therapeutic intervention is likely to be, such as adding some direct therapeutic support to self-administered or online programs to enable the parent to complete and benefit from the program (Day and Sanders 2018). When parents present with impaired intellectual functioning they may have more difficulty understanding, retaining or recalling information, describing what they have done, recalling examples of situations that were problematic, be slower in acquiring new skills, need more practice, and have lower literacy. Glazemakers and Deboutte (2013) showed that parents with intellectual impairment and a history of domestic violence were able to successfully learn positive parenting skills with adjustments of within-session activities including increasing length or number of sessions, less book work, and more practice. Thus, programs need to be flexibly delivered based on clinical judgment of the pace and best processes for parent learning and mastery. For practitioners used to simply providing direct advice and guidance to parents about how to handle particular situations (e.g., primary health care providers), the use of a self-regulation approach in working with parents can represent a major shift in practice. The ability to answer a parent’s question clearly, directly, and with authority is often considered a defining feature of professional expertise, and is highly valued. Many parents also expect practitioners to provide clear answers and advice about how to deal with specific problems. The adoption of a self-regulation approach does not mean that practitioners should stop providing clear guidance, explanations, or learning tools such as live or video demonstrations of procedures, role plays, or feedback to parents. However, the goal in using self-regulation procedures is to promote independence and autonomy in a parent’s problem solving, for example by asking parents to answer their own question by drawing on program learnings to date (see Table 1 for more examples). This also means that any auxiliary prompts, learning aids, tools, or reminders (e.g., tip sheets, charts, video demonstrations, practitioner support) introduced as part of the intervention process should be gradually faded (withdrawn) so that the parent’s future behavior is more under the control of the naturally occurring stimulus events that are part of everyday living with children. These events include the children’s behavior, the parenting situation (e.g., home, out of home), parenting task (e.g., getting ready to go out, dealing with challenging behavior in public), and people that are part of the child’s social world (e.g., partner, other parent) rather than therapy-specific events (e.g., observation room with video cameras, therapist presence) that are not part of normal everyday parenting and are typically temporary and transitional. Several specific challenges when using a self-regulatory approach are discussed below and possible solutions to resolve them are identified. When a parent asks a direct question such as “What’s the best way to handle a temper tantrum when we are shopping for groceries?”, they generally expect an answer. If strategies for dealing with tantrums out of home have not yet been introduced, the practitioner can respond with a prompt that encourages the parent to generalize what they have learned about tantrum management at home (e.g., “Think about how you deal with tantrums at home, and ask yourself whether the same strategy could be used here.”). Alternatively, the practitioner can invite the parent to reflect on the differences between situations (“What are the main differences between a tantrum at home and when you are shopping? OK, so if your child gets bored, how could you make shopping more interesting?”). Prompting development of a planned activities routine would be helpful here (see Table 1). One commonly used method of training in parenting programs is coaching. Coaching is used when teaching parents to employ a new skill in managing a problem. It involves a brief structured interaction involving parent, child, and practitioner (observing), in which a practice goal is established, the practitioner observes a parent and child interacting, and then provides constructive feedback to the parent about how they managed the situation. Because these interactions can be highly reinforcing to parents, they may need to be prepared so they can become less reliant on practitioner feedback to maintain the skill, such as with signaled fading of feedback. This involves explaining to the parent in advance that during this practice session, the practitioner will not say anything after observing, and that the parent will be asked to review for themselves how it went. As described in Table 1, guided discussion hands responsibility for self-appraisal over to the parent (“What did you do well? What did you not do quite so well? What will you aim to do differently next time?”). The basic message is that managing on their own is the next challenge. Other examples of fading include asking the parent to try solving a problem without referring to tip sheets, reminders, charts, or any other program resources that were previously introduced as part of the program. Success is defined by effective use of the program learnings in the absence of artificial supports. A number of implications emerge from this discussion of self-regulation in parents, its impact on parenting practices and children’s development, and how parenting support programs might be structured and delivered to foster activation of and improvement in parental self-regulation. These implications apply to both research and practice. More research is needed across a variety of domains related to self-regulation and parenting. The first need is to clearly define the parameters of self-regulation in adults, and the aspects of self-regulation that are most salient to effective parenting. Are the capacities defined in this paper (self-sufficiency, self-efficacy, self-management, personal agency, and problem-solving) the key constructs, or are there more or different constructs? How should they be operationally defined as they relate to cognitive, emotional, and behavioral control processes in adults in general, and to parenting behaviors in particular? Relatedly, there is a need for better measurement of self-regulation in parents, children, and practitioners. For parents, reliable, valid, and efficient measures are needed that assess key cognitive, emotional, and behavioral regulation capacities as they relate to parenting practices; progress in measurement is fundamental to further research in this area. For children, further development of valid and efficient measures of children’s self-regulation will enable study of the relationship between parents’ and children’s self-regulatory processes. Finally, valid measurement of practitioner behaviors that effectively promote parents’ self-regulatory processes will inform improvements to parenting support practices. Next, further research is needed to better understand the specific relationships between parental self-regulation and parenting practices. How are the specific tasks and responsibilities of parenting related to parents’ self-regulation capacities? How do parental self-regulation and the associated parenting practices promote self-regulation in children? How does self-regulation function as a mechanism of change in parenting interventions, and what role does parents’ self-regulation play in parents successfully improving (or not) their parenting practices and interactions with their children? What are the modifiable determinants of parental self-regulation in the individual and in the environment—what promotes it and what hinders it? In the realm of intervention, research is needed on how to most effectively promote self-regulation skills in parents, and how parents can best teach self-regulation skills to their children (e.g., Lengua et al. 2018). What, precisely, should parents be doing to foster development of different aspects of self-regulation in their children, and how can we strengthen parenting programs to better address this? How should parenting interventions be structured and delivered to enhance parents’ capacities for self-management, cognitive flexibility, confidence, and effectiveness in resolving parenting challenges, and maintaining positive changes over time? This research would establish the empirical basis for best practices in a self-regulatory approach to parenting support interventions. Intervention research could also usefully elucidate whether there is added value to including specific content modules in parenting programs focused explicitly on self-regulation. If so, it could determine for whom this enhanced content might be most beneficial (e.g., defined by parent skill level, cognitive capacity, mental health, self-regulation capacity) and the extent to which the effects of such training might be generalizable to non-parenting situations. In addition, the research on self-directed technology-based parenting interventions is still nascent. More research is needed on the appropriate role of online and other technology-based self-directed interventions in the ecosystem of parenting support services as a complement to more intensive interventions. This includes: the role of self-regulatory processes in these interventions; the differential effects of fully self-directed vs practitioner support on parents’ self-regulation; and how much, to whom, and by what means supplemental practitioner support should be delivered to maximize engagement and effectiveness. With regard to program engagement, more research is needed on how to approach engagement challenges from a self-regulatory point of view. When are parents exercising active choice to discontinue a program and when should they receive extra support to continue engagement? What works for whom, and how much support is needed to provide parents with the appropriate level of intervention that suits their needs and preferences? Several implications of this discussion of parental self-regulation emerge in the context of practice. First, evidence-based parenting programs and training materials need to articulate how the program addresses self-regulation concepts, and if needed, further develop content addressing these concepts. Applying self-regulation principles in the delivery of parenting interventions also has many implications for practitioner training and practice, such as: how to promote parental self-regulation and teach parents the tools of personal change, self-management, independent problem solving, and generalizing learnings; how to empower parents to choose their goals, the type of support they want, and at what dosage; how to discern when parents need more or less practitioner support to achieve their goals; and how to effectively titrate support to build self-sufficiency and personal agency. Practitioners may be challenged by changes to their typical practices that this approach implies, such as the need to dial back on issuing directives to the parent and instead develop a more collaborative partnership with parents. In addition, to the extent that self-directed parenting programs are successful, practitioners may increasingly be deployed to provide ancillary support to technology-based programs and work more intensively in person with predominantly higher-need parents who have not been successful with self-directed approaches and/or who prefer an in-person approach. Finally, this discussion has implications for the role of parents as consumers and end users of services. As parents are increasingly informed about their choices for evidence-based parenting support, they can be a voice for their own needs and preferences. Parents’ views as consumers are being increasingly sought and listened to in planning parenting services. Sanders and Kirby (2012) argued that consumer input should occur throughout the entire research, development, and dissemination process. For example, in developing a media series on parenting based on Triple P principles and techniques, Metzler et al. (2012) surveyed parents of children with early onset conduct problems to determine whether video segments were helpful, relevant, and culturally appropriate. Similar approaches have been used to determine whether program delivery methods and content are acceptable for diverse populations such as Māori parents in New Zealand (Keown et al. 2018), low-income parents in Panama (Mejia et al. 2012), and parents of children with a disability (Sanders et al. 2004). To encourage parents to identify strongly with evidence-based positive parenting programs and advocate for their use with other parents, meaningful engagement with parents as consumers should be the hallmark of an ethically responsible and inclusive research, development, evaluation, and dissemination process. Parents (and their families) are the ultimate beneficiaries of good quality parenting programs that provide opportunities for parents to enhance their self-regulation capacities. A self-regulation approach to providing parenting support empowers parents to be actively involved in decision making that affects their parenting confidence and competence. Strengthening parents’ role as consumers of parenting services by empowering consumer demand for evidence-based parenting programs, greater parent input into the design of parenting support programs, and greater attention to the importance of parents’ own self-regulation will be of benefit to the entire field (National Academies of Sciences, Engineering, and Medicine 2016). All authors contributed to the conception and writing of this work and approved the final manuscript. The Triple P—Positive Parenting Program system discussed here is developed and owned by The University of Queensland (UQ). Royalties from the programs are distributed to the Parenting and Family Support Centre, School of Psychology and Faculty of Health and Behavioral Sciences at UQ, and contributory authors of published resources. Triple P International (TPI) Pty Ltd is a private company licensed by Uniquest, Pty Ltd, a commercialization company of UQ, to publish and disseminate Triple P and related programs worldwide. The authors of this paper have no share or ownership of TPI. MS and KT are contributory Triple P authors and receive royalties from TPI. CM is supported by National Institute on Drug Abuse Grant # R01 DA021307-06. This article does not contain any studies with humans or animals performed by any of the authors. Calam, R. M., & Bee, P. E. (2018). Self-regulation and parental mental health. In R. Matthew, Sanders & A. Morawska (Eds. ), Handbook of parenting and child development across the lifespan. https://doi.org/10.1007/978-3-319-94598-9_16. Crandall, A., Deater-Deckard, K., & Riley, A. W. (2015). Maternal emotion and cognitive control capacities and parenting: A conceptual framework. Developmental Review, 36. https://doi.org/10.1016/j.dr.2015.01.004. Harrison, M. J. (2017). Can we help but overreact? : The relationship between impulsivity, parenting knowledge and disciplinary style. Doctoral dissertation. Retrieved from https://researchoutput.csu.edu.au/en/publications/.